Don't worry if your favorite Batman villain doesn't make it into Arkham City, it seems that he or she could very well turn up in the DLC. Kevin Conroy, the voice actor who provides Batman's voice in Batman: The Animated Series, Justice League Unlimited, and, of course, Arkham Asylum, has described his latest bat-project, Arkham City, as an "ongoing game," and says that developer Rocksteady has plans to expand the game with downloadable episodes. 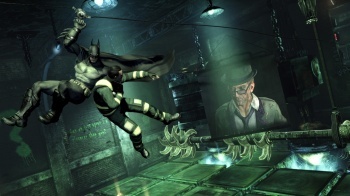 In an interview with the site ComicBooked, Conroy said that he had been recording dialogue for Arkham City for quite a while and expected that to continue into the future. He also said that he had to be very careful about what he said about the game, for fear of announcing something too soon. He said that people often tried to wheedle plot details out of him, and Warner Bros. would have a little fit if they thought he might say something he shouldn't. "I had a guy at a conference try and trick me into telling who the villains were in [Arkham City]," he said. "And Warner Bros. called me that night and said, 'DON'T YOU EVER SAY ANYTHING LIKE THAT EVER AGAIN IN ANY KIND OF INTERVIEW!' I said, 'I knew the guy was trying to trick me, didn't you get it?' ... I have to be very careful." It has to be said though, revealing a game's DLC strategy before the official announcement sounds like one of those things he shouldn't really have said. While there will be those who rail against the idea that Rocksteady and Warner are planning DLC before the game even comes out - despite the fact that that's just how games are made now - for plenty of Batman fans this will come as very welcome news. The concept of Arkham City really lends itself to being expanded, and Batman does not lack for interesting villains. We've asked Rocksteady for official confirmation of the news, and will update if and when we get it. Batman: Arkham City comes out for PC, PS3, and Xbox 350 on October 18th.